Richard Clark Shipston was born circa 1914 in New York. Clark Shipston and Esther Anne Donaby appeared in the US federal census of 1 January 1920 in Niagara Falls, Niagara County, New York, at Ashland Avenue. Other members of the household included Richard Clark Shipston, Edith E. Shipston, Ruth H. Shipston, Thomas D. Shipston and George William Shipston. Clark Shipston and Esther Anne Donaby appeared in the US federal census of 1 April 1930 in Niagara Falls, Niagara County, New York, at 1170 Main Street. Other members of the household included Richard Clark Shipston, Esther Anne Shipston, Ruth H. Shipston, Thomas D. Shipston, George William Shipston, Edith E. Shipston and William F. Whaley. The following appeared on 11 June 1932 in the Niagara Falls Gazette: Three Niagara Falls students were graduated from the Manlius school, Manlius, N. Y., at commencement exercises in Knox hall there this morning. The 1932 class at Manlius numbered 50 students. The Niagara Falls graduates are Charles Arthur and William Oliver Doherty, brothers and sons of Mr. and Mrs. Charles Doherty of Lewiston Heights, and Richard Clark Shipston, son of Mr. and Mrs. Clark Shipston of 1120 Main street. Shipston's brother graduated from Manlius in 1930. . . . Shipston was a private in Company A. he played on his company football team in 1931. He was a member of the DeMolay club and the Society of Chapel Wardens. He will attend the University of Pennsylvania. Clark Shipston and Esther Anne Donaby appeared in the US federal census of 1 April 1940 in Niagara Falls, Niagara County, New York, at 803 Ontario Avenue. Other members of the household included Richard Clark Shipston, George William Shipston. He was employed as a stockerman by [his father's] coal company, according to the 1940 census. Richard Clark Shipston died on 13 December 1944 killed in action in Leyte in the Pacific. 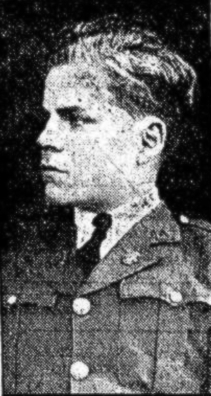 The following appeared on 13 January 1945 in the Niagara Falls Gazette: Private First Class Richard C. Shipston, son of Mr. and Mrs. Clark Shipston, of this city, was killed in action in Leyte in the Pacific, according to a message received by his wife, Mrs. Margaret Shipston, of the secretarial staff of the post hospital at Fort Niagara, yesterday. The date of Private Shipston's death was given in the telegram as December 13. Private First Class Shipston was born in Niagara Falls and was 29. He was a graduate of Manlius Military school and attended Ohio State university. Before entering the armed services three years ago he was associated with his father in the operation of the Shipston gasoline service station in Whilpool street. Besides his wife and parents, he is survived by three sisters, Mrs. Thomas Whaley, Mrs. Henry Hulst and Miss Margaret Shipston, of this city, and two brothers, Lieutenant Thomas D. Shipston, now in California, and George W. Shipston, of this city.